Anti-stick pans have to be one of the greatest inventions for culinary use ever to grace our kitchens. Gone are the days of having to scratch rice off the bottom of a pan with a knife, or having to stir chilli every two minutes – now you can instead set it to cook and then easily wipe it out afterward with no intervention on your part. Unfortunately the non-stick pan has a little bit of a bad name for itself thanks to the common inclusion of Teflon. Here we will look at what the problem with Teflon is and whether your non-stick pans really could be dangerous to you. Teflon was discovered in 1938 and is the brand name of ‘polytetrafluoroethylene’ and was the first non-stick coating for kitchenware. 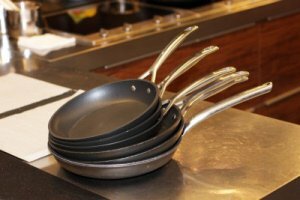 95% of Americans have some detectable levels of Teflon in their blood and some of this comes from the use of Teflon coated pans. Unfortunately though Teflon did a good job of protecting pans, it was also easily scratched by cooking utensils and this then meant that small bits would flake off into cooking. Furthermore, burning pans with Teflon coating can cause fumes to be released into the air and breathed in. Today this has been largely replaced by Silverstone, but while this is more durable and less likely to come off in your food, Silverstone was essentially a form of Teflon. These coatings aren’t just on pots and pans either, they’re also on pizza boxes, lunch boxes, microwaveable popcorn bags, packages for baked goods and more. Even some clothing uses Teflon to repel water. Teflon is a form of PTFE gas which can cause severe edematous pneumonia. This causes the hemorrhaging of the lungs which results in the body drowning by its own bodily fluids. The condition is caused when breathing in the fumes and is known as ‘polymer fume fever’. The symptoms include shortness of breath, malaise, chest tightness, chills, cough, sore throat and high temperature. It is also a potential carcinogen (it is in animals); translation – it may cause cancer. These gasses can also affect small animals and children more quickly than humans, and some individuals who keep birds in their home have found they suffer sudden death as a result of Teflon fumes – much like the canaries in coal mines. The good news is that action is being taken to prevent the use of ‘controversial’ chemicals in the manufacture of Teflon and products. You can also help to limit the damage it can cause yourself by avoiding burning your food by cooking longer at a low heat, and by making sure your kitchen is well ventilated while you are cooking – use an extractor fan to remove fumes and open a window. You should also never preheat the pan without some liquid or food in it. If you get cardboard containers from takeaways, then avoid using them in the microwave as they will likely also use Teflon to prevent sticking. This discussion is misleading. There is negligible threat from *cooking* (or eating), the threat is from the manufacturing chemical PFOA (perfluorooctanoic acid) and from gases released if the pan is heated over 500F — about 100F hotter than where oils and butter will smoke. The major hazard is if you own a bird. Also, if you bring up Silverstone, instead of implying a threat, you should discuss it's properties when heated.